All About Lifting & Safety can offer your business a range of tirfors in a range of lifting capacities. Tirfors are the practical choice when the lift is particularly high, or the distance covered is substantial, as they can accommodate any length of winch cable or rope. Tirfors can operate in any direction; horizontally, vertically, or at any other angle, as well as at any height or distance. Tirfors are portable, precise and they are safe. The load placement achieved by these machines is very accurate. A tirfor requires no power source, so these machines are ideal for construction sites. It takes just one person to operate a tirfor, using a telescopic handle. They are also compact, so they can fit into tight corners. Tirfors are used in many applications, including civil engineering and manufacturing. They work on a simple hand over hand principle that has been used by people for centuries: one hand holds the rope while the other lifts. Tirfors have two jaw grips: one pulls the winch rope, while the other clamps it. It works on a simple cam system of backward and forward motion. Tirfors have U shaped jaw blocks which prevent the winch cable or rope from wearing. The tirfor action is smooth, so you don’t have to worry about the load shifting. The tirfor winch rope is specially designed because it undergoes very different stresses than those of a conventional hoist. The winch rope must withstand the clamping forces between the jaws. 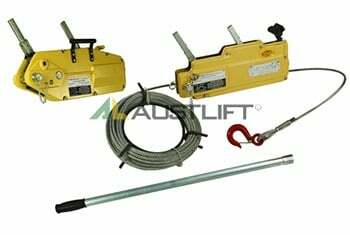 It is for this reason that All About Lifting & Safety supplies all tirfors with the matching paired winch cable, ensuring that all the lifting that you do with our equipment is safe. It is possible to substantially increase the nominal lifting or pulling power of tirfors by adding sheave blocks to the system. 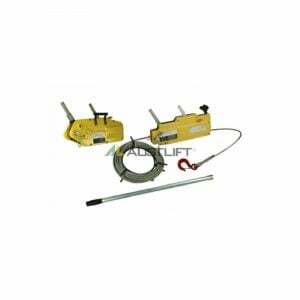 If you’re looking for tirfor winches, cable or rope contact the experts today – All About Lifting & Safety.